Approximately a week after the Saudi National Day, on the next Sunday, to be precise, Dr. Yasser, my pediatric colleague returned to work after his annual holiday. The same evening, I proceeded on a week's leave. Unlike the previous occasions, though, I did not immediately proceed to Ta'if, but relaxed in my house for a few days; the reason was that I wasn't flush with spare money this month, and wanted to save if I could. On Tuesday morning, however, I proceeded to Ta'if. The agenda was to visit the Ta'if Health Directorate, also known as the Muderiya, where I was to enquire about Dr. Narendra's pending moneys, and to visit Chaudhary Shabbir, the car mechanic who is also my friend now, to settle his previous bill and to get my car checked for any pending problems. In the event, the trip was uneventful, and after checking in at the Ahla Saif hotel, I went to the Muderiya to enquire about Dr. Narendra's pending salary. The journey proved to be futile, as the people in charge of this department could not unravel the mystery behind this long delay. Not only that, they made me go to other offices, and in one such office, a rather officious looking middle-aged gentleman brooded over a large folder, turning more than 200 pages, looking for some paper that could unlock the payment. At the end of his laborious search, nothing was found. The officer in charge then told me he would personally look into the problem and see what could be done. Thus, I parted. After this, I went to Chaudhry Shabbir, but he was extremely busy that morning, and I had to return to the hotel for a day that was otherwise empty. I had my lunch at the Asian restaurant, of course. It was in the evening that I had a surprise call from our E.R. 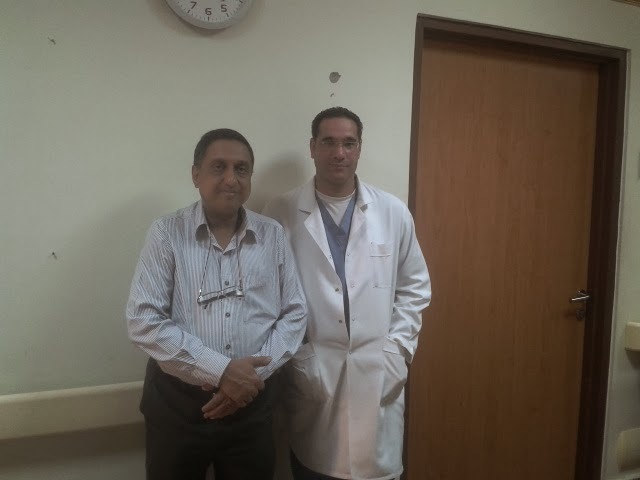 resident Dr. Mohammad Abd'Jawad. He was on his final mission to Ta'if to make some purchases ... he is due to exit next week. He informed me that he was in the same hotel where I was, that he had booked a room, and that he would be in Ta'if for the next few days, and could we meet? Ha ha. Of course, we could! I just had to walk across the floor and go and meet him in a room on the same floor. We went out together for an Indian dinner. I must say that he seemed to enjoy the meal. We decided to go out for an Egyptian meal the next day! The next morning, I hit the road to go to Ta'if University where I went to the office of the Saudi Council for Health Specialities (SCFHS) to file for a refund of the money that I paid TWICE to obtain the same certificate of Good Standing (that I later submitted to the online application of the Dubai Health Authority (DHA). There was a form that I had to fill, and submit it with the original of the payment I had made to the Saudi Council earlier through the bank. I had a tough time locating the office, though, as the Ta'if University is spread out over a large area. Ultimately, I discovered that it was inside the College of Pharmacy. During my visit, I also visited the college cafetaria, where I partook of a cup of tea and a chicken sandwich (in Saudi Arabia, a roll is called a sandwich). 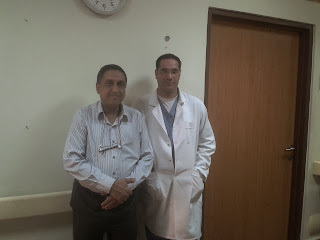 I was considerably delayed, and Dr. Mohammad and I could not meet for lunch. We did meet in the evening, though. My car was already with Mr. Shabbir, and Mohammad and I went out on foot, with him stopping in various shops to purchase stuff from bags, to clothes, to other things such as gifts for the children in his extended family. We had dinner at the Vitamin Palace, an eatery on Abu Bakkar Siddiq road. The meal consisted of two sandwiches and a juice each. The Egyptian meal would have to wait for the next day. Which is exactly what we did: the next afternoon, we visited a place on Abu Bakkar Street: this shop, called the Faroula restaurant, is well-known for its authentic Egyptian food. The food turned out to be quite different from the various things I have eaten so far, and that includes Egyptian meals eaten by me at various doctors' homes during the various parties and Iftaars that I have attended in the past. Dr. Mohammad left for Al Muwayh the same evening, and I stayed on for one more night, savouring my off days for the first time in a long time. It was on Friday evening that I returned to Al Muwayh. And that brings me to the end of this rather lengthy post. P. S. The car repairs cost another SR 1000 (this included the charges for the delco that the mechanic had replaced the other day when he came to Al Muwayh specially for me with his colleague). P. P. S. I bought a new rice cooker and also bought a few new Tee-shirts on this trip, as also many eatables and food from the Asian restaurant before returning to Al Muwayh.